Did you ever wonder what it must have been like during the golden age of magic? Imagine meeting people like Houdini, Kellar, Herrmann, Malini, and so many others. What would it have been like to sit at the feet of these masters and learn the secrets that made them famous? Well, unfortunately those icons of conjuring have passed on long ago. I'm about to relate a story of my encounter with an individual who has a rare connection with another time, a time when magic was ruled the entertainment world. His name is Cesareo Peleaz. He was born in Cuba during the 1930's and as a child had the opportunity to see many of the great travelling magic shows of old. One of the shows that Cesareo saw was the FuManchu Show. Fu-Manchu was the stage name of David Bamberg, the son of Okito. 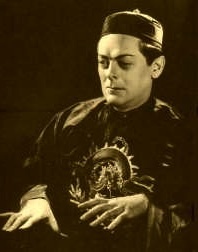 David was arguably the best magician of the twentieth century. North American audiences aren't as familiar with him because Fu-Manchu traveled mostly in South America. The Bamberg family produced magicians for seven generations. David Bamberg being the last in the family. As a young boy Cesareo was exposed to the magic of Fu Manchu. It made a lasting impression on his developing mind. So much so that many years later, after Cesareo had immigrated to the U.S. and settled in New England, he gathered a group of friends together and purchased an old vaudeville theatre. The intention was to repair it and put on a show in the grand tradition of Fu Manchu and Okito and the travelling caravans of yesteryear. 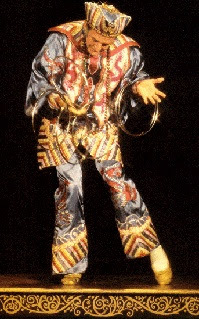 On February 20, 1977 Le Grand David and his own Spectacular Magic Company opened at the Cabot Street Cinema Theatre to a huge audience. Cesareo's dream of a classic magic show had become a reality. In 1980, as a teenager, I would have the opportunity to see this show. I remember a great deal of the program to this day. Some of the most amazing things I recall still were the fact that they built everything in-house, props, sets, scenery, costumes, not to mention the fact that they had totally refurbished the theatre itself into a beautiful showplace. Let's move ahead. It's now April of 2000. I have accepted an invitation to be Cesareo's guest for the weekend in Beverly, Mass.. Stepping into a theatre 20 years later is a unique experience. Much had changed and much was the same. But more than anything I was anxious to meet this man they called 'Marco the Magi', Cesareo Peleaz. The first time I saw him, he appeared from nowhere and vanished in much the same way. I don't jest about that either, I turned my head and he was gone. Later in the day while sitting in the dressing room of their sister theatre, the Larcom, Cesareo sent for me. He gave me a tour of the Larcom Museum, the place where all the old illusions from past shows are on display. For an illusionist this is like being a kid in a candy store. As the room became illuminated, I was awestruck with the treasures in front of me. Before my eyes were the most beautiful illusions and stage magic I'd ever seen. I recognized so many pieces from magic history books. They had been faithfully recreated and special touches were added to make them unique to the Le Grand David Show. My favorite part of this tour was when Cesareo stopped to show me a small black box. Next to it, was a green and white box, very ornate, very beautiful. As he opened the doors I could see that the inside was just as intricately painted as the outside. He spoke to me of the attention to detail that every prop receives. He pointed out another gorgeous box with several oriental figures painted on the front. Cesareo smiled at me and said, "we don't use decals either". How could he know that I was just thinking, "they must be decals"? I had read a book once called ILLUSION SHOW, the autobiography of David Bamberg published by David Mayer Books. There is a story in this book of David building a box and hand painting it. His father Okito was a skilled craftsman and upon seeing the box for the first time was quite astonished. But when he opened the lid and looked inside he saw that it wasn't finished. "David, what about the inside" he said. "No one ever sees the inside" David replied. "If you don't finish the inside, the box will never be complete. It's like wearing dirty underwear, no one else knows, but you know. You won't be happy unless the inside is finished just like the outside" Okito told his son. David realized his father was right and he finished the inside just like the outside. I bring that story up because it is identical to my experience in the Museum with Cesareo. He was subtly teaching me the importance of details. It's the little things that make all the difference in the world. As the saying goes, God is in the details. Cesareo is a proponent of detailed work. Everywhere you go in the Larcom and the Cabot Street Cinema Theatre you are captivated by the details. William Ellsworth Robinson, better known to us as Chung Ling Soo had one prime concern above all others, DETAIL. It was evident in his costumes, his props and his posters. So it is with the Le Grand David Show. Cesareo Peleaz has taken this attention to detail to new heights. Some might say it is time wasted. But the tiny little details are what make the Le Grand David show so incredible. Through the details the performance becomes a pageant of wonder. All this attention to detail radiates beyond the footlights and you can't help but fall under the spell of their spectacular magic. Could Fu-Manchu himself teach this lesson any better? I seriously doubt it. You are right - and it is the details that people remember too.